It’s been awhile since my Z3 “Off-Roadster” became mildly internet famous. Unfortunately it wasn’t a reasonable vehicle to keep around and I don’t have endless space so after months of trying to sell it off I ended up parting it out. 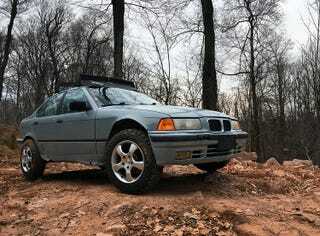 This is the story of my next off color project: A lifted, big tire, 93 BMW 318i. I have two goals with projects like this: Make it fun and usable and do it with as little out of pocket expense as possible. I’m an avid E36 enthusiast and shortly after the demise of the z3 my brother came into a cheap, somewhat rusty 93' 318i. Then, we parked it and forgot about it again. My brother drove it to work once or twice but neither of us had much time for a project at the time and it needed some refining so it sat in his driveway for over a year after that. Recently I came into an E28 528e parts car. My brother needed much of the car for another long forgotten project so we made a deal: E28 parts to him, ownership of this car to me. I decided at this point that it was time to bring to car to my garage and finish it up. Sitting around unused under a tree wasn’t kind to it so on top of finishing it up I had a massive amount of cleaning to do inside and out. The tires we used were from the Z3 project. They were a bit too big and had become dry rotted while sitting so I searched around for a suitable replacement. I was not interested in spending a fortune on tires so I searched craigslist in various sizes that I thought might work until I found a Subaru owner selling some 215/65/16 Bf Goodrich KO2's after returning his car to stock for a reasonable price so I jumped on the opportunity. I had a set of 90's 16" Mille Miglia wheels sitting behind my garage that had generated no interest when I tried to sell them so this was the perfect time make use of them. I mounted the tires and swapped the new setup on before loading it up as the original tires had gone flat while sitting. After a stop at the carwash on the way home I was ready to get started on finishing this thing up. The front springs had broken while sitting and the rear lift was sketchy so I needed to make some changes to both. Fresh off of the trailer, broken springs, no front bumper. Front: Aluminum Strut spacers, approximately 2". These are mounted on the top of the strut mounts. I removed the studs and used longer hardware and a bent wrench to put it all together. The spacers are actually the end caps to a 90's era strut bar. Intentions were to replace them eventually but they seem to do the job just fine. Springs are stock from a 92' 318i on stock replacement Bilstein struts. I don’t have any technical data to back it up, but I’ve always thought that 92' springs looked taller than later springs when they switched to control arm mounted endlinks. Speaking of endlinks, the stock swaybar and links are used. If I’d want to do any serious offroad stuff I’d likely pull the bar completely but for street use I’ve left it for stability. Body: Front fenders are cut as well as the nose panel and front bumper and fenders are flared out with some edging to avoid cuts. Rear fenders were rolled very precisely with a baseball bat. Roof rack is a very period correct snowboard rack meant for a Jeep Cherokee that has been modified to fit the E36 with a homemade wind deflector. The white paint was pretty crappy and I wanted something a bit more unique anyway so I sprayed the car with Krylon Smoke Gray (rattle cans). I left the roof white mainly out of laziness and it looks alright. It’s not perfect and obviously not high quality paint but, cost was about $30, it’ll be easy to touch up when things get beat up, and it covered up the ugly spots. It’s a cut up old car, I didn’t fix any dents or try to fix the rust. Lipstick on a pig. The interior was gross from sitting and the previous owner so I spent the better part of a Saturday afternoon cleaning it up. The rare Ultramarine Blue Vinyl is so ugly that it’s perfect! After everything was cleaned up, the suspension was dialed in and I addressed some minor mechanical issues to be roadworthy I took it out to a friend’s secluded property to test it out and take some pictures. The car has very rusty rockers, otherwise it has aged well (paint aside). The interior is in great shape and the major mechanical components function as they should. With 187,000 miles on the clock the 1.8L 4 cylinder engine runs smoothly and is free of major leaks. The getrag 5 speed manual transmission shifts well and the 3.45 Limited Slip differential functioned well when put to the test. The V belts squeak a bit, the driver’s window is off track, there’s a noticeable leak from the differential drain plug, a torn CV boot, as well as the typical E36 Airbag light. I plan to address these items, enjoy the car a bit and then do as I always do and list it for sale so I can start another project! It is titled and registered Antique in Pennsylvania (25 years and older qualify here). This means it does not require safety or emissions inspections but it cannot be used as daily transportation. The verbiage mentions 1 day a week or attending events/shows. Remember That Stupid "Off-Roadster" Z3? Here&apos;s The Story.